It's back to school with a Community Maps Data Prep Tools Update! Well, it’s back to school season and with that comes hoarding supplies, buying books, and collecting tools to help get through it all. We wanted to make sure our contributors had the tools they needed by providing a Version 3.0 Release of the Community Maps Data Prep Tools. These easy-to-use tools assist contributors with preparing basemap layers for submission, standardize content, speed up data integration – what’s not to like about that? So, you can retire the former CM DataPrepTools Version 2.0! The tools work in both ArcMap (10.4.1 and higher) and ArcGIS Pro (2.2.1). Tool parameters (i.e., the query statements) are automatically saved to a parameters file, and the tools remember your previous settings. This means you can easily re-run a tool without needing to enter the query statements each time. You can also save the parameters and re-use them when you re-run the tools for your next data contribution. The Road Centerline Tool has been simplified and combined into a single tool (no more Part1 and Part2). There is a new tool to support contributors who want to provide Address points or polygons. 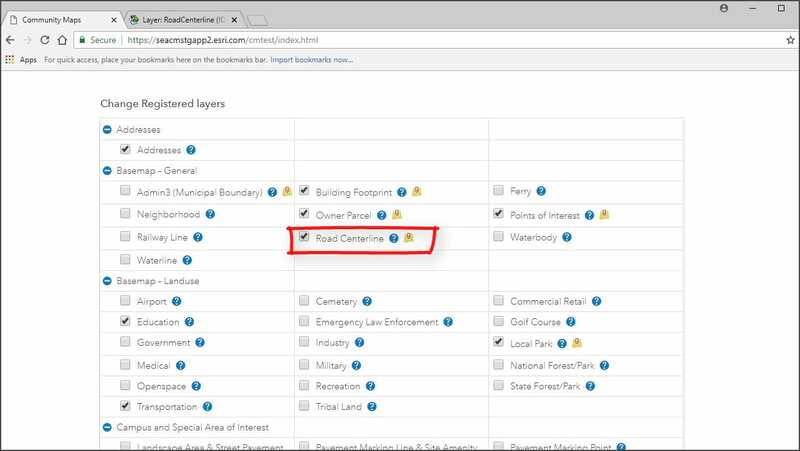 The output layer is used by the Esri Geocoding Team to improve accuracy in the ArcGIS World Geocoding Service – as opposed to these being features added to the Esri basemaps. 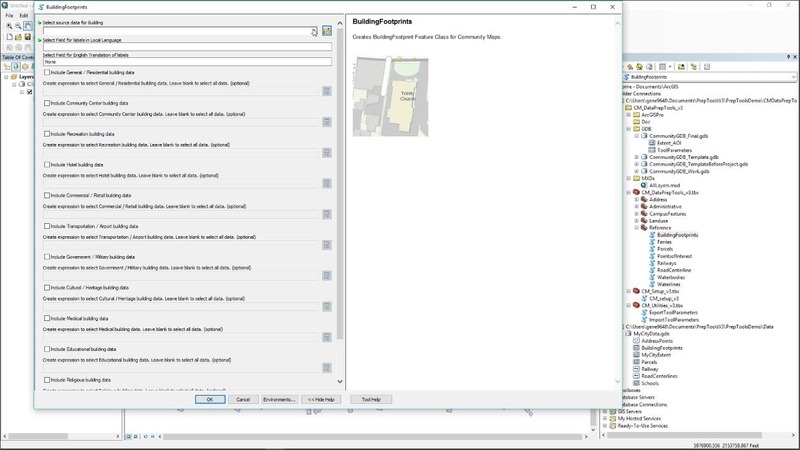 This video provides an introduction to the Community Maps Data Prep Tools. It demonstrates how to download the tools, explores the resources that are included in the download, shows you how to begin by running the Setup Tool, and gives an example of running the Building Footprint Tool. Click the image below to view the video. When you run a tool in Version 3.x of the Community Maps Data Prep Tools, your queries and other settings are saved in a Parameters file. Storing this information makes it incredibly easy to re-run the tool without re-entering all of these queries. 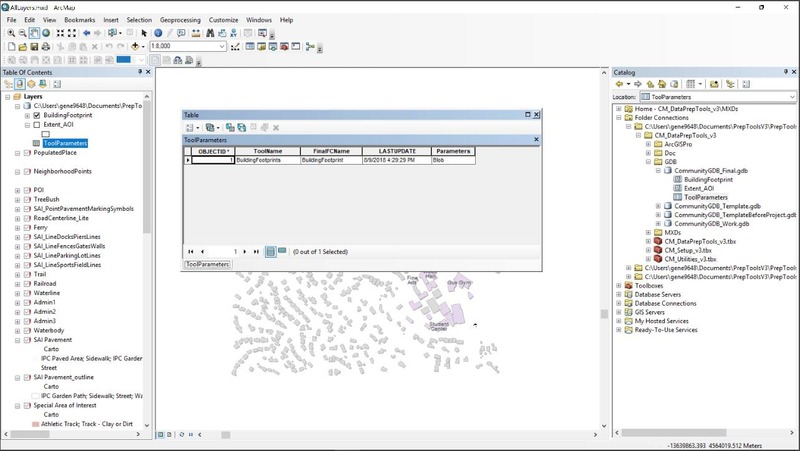 This video provides an explanation of how to Save and re-use your query parameters in the Community Maps Data Prep Tools. It demonstrates where the parameters are saved, how they are used, and how to save and retrieve them for your next data contribution. Click the image below to view the video. This video highlights new capabilities of the Community Maps Contributor App. Among other things, the big news here is that this latest release includes the ability to provide Road Centerline data in the form of a Service, which was requested the most from our contributors. Click the image below to view the video. OK, you’ve been patient, so here they are. Click the image below to download the new tools now and get started on that basemap layer submission! If you have not yet registered with Esri’s Community Maps Program, you can get that done here. Have questions? Email the Community Maps Team (communitymaps@esri.com).